Well packaged, others I have bought have broken in transit. Love them, so do the guests! We love these biscuits. And the guests do too. Will be ordering again. My guests love these. So do I. Very pleased with these biscuits, normally have border, but prefer these now. Excellent biscuits. Handy twin packs with four different biscuit types. Excellent, good variety of flavours. Our guests loved these biscuits. Great biscuits but a lot are broken due to courier I suppose, but bit of a pain when you give customer one and they are in bits, packing should be better. Our guests love these biscuits. I love these biscuits and so do my guests. Always popular. I agree with Martha Holmes. 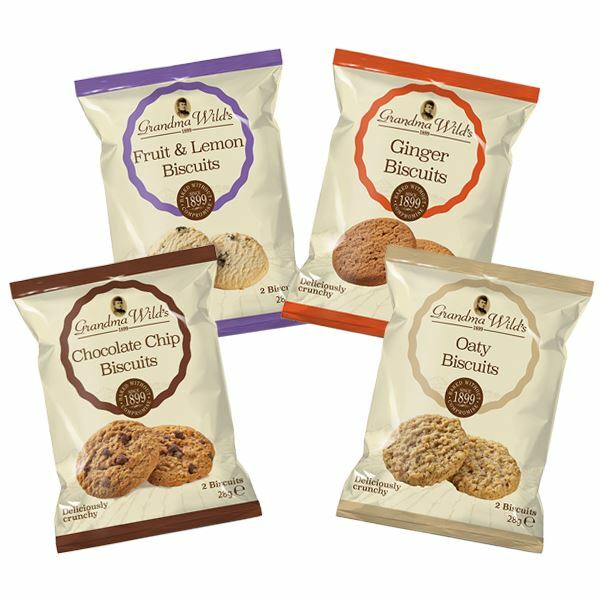 These Grandma Wilds Biscuits do taste of the flavour listed on the pack. This is the second time I have ordered and they still go down a treat with the guests at Bryncalled Barns Holiday Cottages. These are super biscuits, much nicer than the Borders ones we used to have, and cheaper! Quite nice but not as large or quite as good as the Border selection. Having progressed from basic to Borders we then tried Grandma Wilds. They are streaks ahead - fantastic biscuits and a fabulous price!